A compelling welcome to Osmo's Chromaplex Fibre Bond Technology. 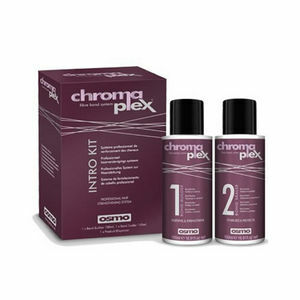 Osmo Chromaplex Intro Kit will get you firmly on the road to strengthening and improving the hair colouration process for your clients. 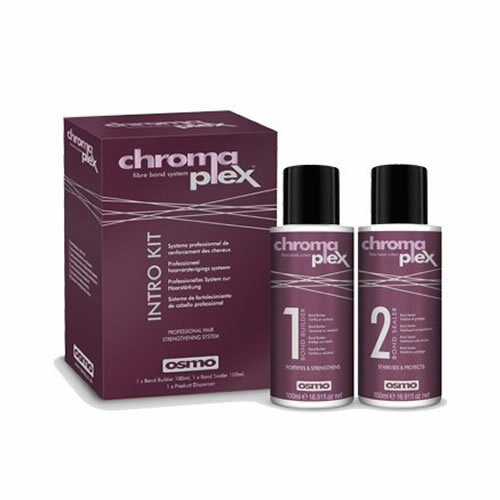 It's the first 2 stages in a revolutionary treatment designed to be used in combination with any professional salon colour, bleach or chemical formula. The Kit contains 1 x bottle of Bond Builder 100ml and 1 x bottle of Bond Sealer 100ml. The Bond Builder travels deep inside the hair shaft, reconnecting ravaged hair bonds and restoring elasticity. Further, it adds moisture and strengthening properties, which means less damage, more shine and incredible vibrant colour. The Bond Sealer is a productive and nurturing treatment cream that helps to coat and seal the hair shaft for smoother, sleeker and more vibrant colour results. This means smoother, sleeker and more vibrant colour results. Used together, these great products help strengthen damaged hair fibres—minimising breakage and improving overall condition without compromising on development time, neutralisation or lifting. £22.98 (inc. VAT) Why no VAT? We're a trade wholesaler and quote our prices without VAT to help our VAT-registered customers understand the true cost of a purchase. A brilliant strengthening conditioner that's the final caring step in the range of Osmo's Fibre Bond Technology treatments.